Pluto may be small, but it is proving to be big on surprises. With NASA's New Horizons spacecraft now speeding toward it, our understanding of the dwarf planet should transform even further. "We've never had a reconnaissance of a dwarf planet such as Pluto before, and every time we've been to a new type of planet, we find nature is much richer than we expected," New Horizons principal investigator Alan Stern, of the Southwest Research Institute in Boulder, Colo., told SPACE.com. New Horizons will be the first up-close reconnaissance of Pluto in history. It will mark one of the first times scientists get to study a new type of planet this close since the 1970s, when NASA explored the giant planet Jupiter. (NASA's Dawn probe is slated to visit the rocky dwarf planet Ceres, the largest asteroid in the solar system, in February 2015). Scientists have already discovered that Pluto apparently changes colors seasonally and has geysers erupting from its surface. As for what might come next, "we don't know for sure what we'll find out there, which is what is so exciting about the mission," Stern said. While Pluto may be small, it has no dearth of moons. In addition to the three moons known since the mid-2000s — Nix, Hydra and its largest, Charon, which is half the size of Pluto — scientists recently discovered a fourth, simply called "P4" for now. 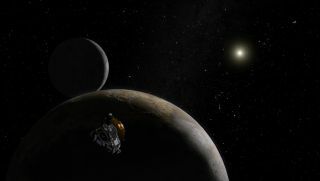 "We should expect Pluto to reveal how complex dwarf planet systems can be," Stern said. "We may even find rings around Pluto." Binary planets are thought to be common in the galaxy, as are binary stars, but no spacecraft has yet explored one. New Horizons will be the first mission to a binary object of any type. "Before space exploration, the thought was that smaller worlds would be less complex than larger ones," Stern said. "But one of the surprises that came with the exploration of planets is that smaller worlds are often extremely complex, sometimes more than bigger worlds." Atmosphere of Pluto ... and Charon? New Horizons carries a variety of sensors "that will let us map the geology and composition and atmosphere and temperature of Pluto, as well as the objects in its system," Stern said. Pluto's atmosphere is escaping to space like a comet's, but on a planetary scale — a phenomenon unlike anything else in the solar system. New Horizons may discover that Charon has an atmosphere as well, albeit an extraordinarily thin one. By studying these atmospheres, scientists might learn more about how the one on our planet — the thin skin that protects us from the void of space, enabling life to take root — evolved.